101 Things: It’s already March? Damn, this year is going fast, and it’s time for Pints & Paws in Sanford! 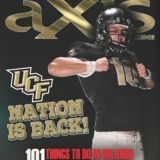 City Soccer, UCF Baseball and so many concerts this month! Your official unofficial call out to all the places to find a Perfect Pint this month! Local boys made good, are back in town at The HOB in March! Miguel was at the arena just like a month or so ago? Too many indie bands with big hair to keep up with! PUBLISHERS: Sean Perry • Rick Wheeler ADVERTISING INQUIRIES: rhweeler@axisproevents.com • 407.230.1365 EDITORIAL INQUIRIES: sperry@axisproevents.com COVER MODELS: IStockPhoto ART DIRECTION: Evan Comtois CONTRIBUTING WRITERS: Jasmine Caldero PHOTOGRAPHY: Sydney Stubbs EVENTS & MARKETING: Erica Dallin • Joshua Gluck • Kelly Nichols Lisa Oster • Claudia Sassano • Nicholas Sensato PUBLISHED BY: Mocomm, Inc. dba aXis Magazine P.O. Box 2391 Orlando, Fl 32802 MAGAZINE: www.Orlando-aXis.com • @aXisOrlando EVENTS: www.aXisproevents.com ©1994-2018 ALL RIGHTS RESERVED Feel free to reproduce without prior written consent from Mocomm Inc, Orlando, Florida since this is the internet generation. THE MILK DISTRICT E. Robinson St., Orlando Milkdistrict.org Saturday. March 10• 4:30 p.m.-1 a.m. / Prices vary Spawned as the stepchild between College Park Jazzfest and Mills50 Love Fest, The Milk District Main Street Program is proud to bring you Rockin’ Robinson, presented by SweetWater Brewing Company. For the first time ever, Robinson Street in the heart of The Milk will be shut down, for the sake of Rock n’ Roll... 4 stages, 18 bands, 10 bucks. Featuring live music, drinks, food, and shopping throughout all of the businesses on Robinson Street. Food trucks, arts, crafts, and street vendors. All Ages on the street, 21+ in the bars, 12 and under are free. ORLANDO MUSEUM OF ART 2416 N. Mills Ave., Orlando Omart.org Through April 29• Times/ Prices vary The exhibition will present 60 outstanding works of art from private collections throughout the State. THORNTON PARK 608 E. Central Blvd., Orlando Thorntonparkdistrics.com Thursday, March 8• 6:30-9:30 p.m. / Prices vary The 2nd Thursday of every month, the best crowd gathers for the Thornton 2nd Thursday Wine + Art Walk.They come to celebrate the community, art, and partake in an evening of sights, sounds, food, shopping, and some tasty tastings all along the walk! ACTION & ADVENTURE/SCIENCE FICTION & FANTASY Friday, March 9 Charles Wallace introduces Meg and her fellow classmate Calvin to three celestial guides-Mrs.Which ,Mrs.Whatsit and Mrs.Who -who have journeyed to Earth to help search for their father, and together they set off on their formidable quest. Traveling via a wrinkling of time and space known as tessering, they are soon transported to worlds beyond their imagination where they must confront a powerful evil. GODS & MONSTERS 5421 International Drive., Orlando Godmonsters.com Saturday. March 10• 12-10 p.m. / Prices vary On March 10th the ZoCORPS Zombie Militia will be recruiting zombies for a crawl/invasion on International Drive. For $15 you’ll be airbrushed and bloodied to look undead and participate in a live event as we walk in character towards The Orlando Eye. Once there we will be provided with drink specials/discounts at The Sugar Factory Orlando! GODS & MONSTERS 5421 International Drive., Orlando Godmonsters.com Saturday. March 10• 2 p.m. / Prices vary This will be a FREE, family-friendly, Horror-filled celebration, with activities throughout the day, vendors, photo op, cosplay, music, movies, gaming, and entertainment. 21 4th Annual It’s Just Yoga Health & Fitness Festival LAKE EOLA PARK Lake Eola Park Itsjustyogafest.com Sunday, March 10 a.m.• 5 p.m. / Prices vary It’s JustYoga festivals are for yogis of all experience levels, ages, shapes and sizes. If it’s your first time this will be the opportunity to learn something new if you’re an experienced yogi you can go to new heights of yoga fun. FALCON FLEA POP-UP MARKET • SUNDAY, MARCH 11 • 1-5:30 P.M.
ORANGE COUNTY REGIONAL HISTORY CENTER 65 E. Central Blvd., Orlando Thehistorycenter.org Thursday, March 15• 7-8:30p.m. / Prices vary Want to try something different for date night or a fun night with your BFF? During the Pottery Studio’s downtown exhibit celebrating its 50th anniversary, the studio has moved its traditional Date Night programs to the History Center. Snack on decadent chocolates and fruit while you create a clay masterpiece. Materials, tools, soothing music, and refreshments will be provided. DOWNTOWN ARTS DISTRICT ORLANDO 29 S. Orange Ave., Orlando Orlandoslice.com/group/cityartsfactory Thursday, March 15• 6-9 p.m. / Prices vary Join thousands of visitors who converge in Downtown Orlando for 3rd Thursday Orlando’s Gallery Hop and Business Networking events! THE PLAZA LIVE 425 N. Bumby Ave., Orlando Plazaliveorlando.com Thursday, March 15• 8 p.m. / Prices vary For one night only, friends, former Bowie bandmates and world-class players perform a career spanning concert of nothing but David Bowie music, David Bowie style. of award-winning Irish talent.Young Dubliners, one of Celtic rock’s hardest working bands, play hundreds of shows to thousands of fans across the United States and Europe each year.They’re back at Raglan Road after their powerhouse performances at last year’s Mighty Festival. LIZZY MCCORMACK’S IRISH PUB 55 N. Orange Ave., Orlando Orlandopubcrawl.com Friday, March 16• 8 p.m. / Prices vary OPC is goin’ Green with a twist this year by giving you a St. Patrick’s Day practice run before the official St. Patrick’s Day. Grab some green and get lucky on this OPC tradition! The OPC Lucky Leprechaun’s will be crawlin all over downtown Orlando. ACTION & ADVENTURE Friday, March 16 Lara Croft is the fiercely independent daughter of an eccentric adventurer who vanished when she was scarcely a teen. Going explicitly against his final wishes, she leaves everything she knows behind in search of her dad’s last-known destination: a fabled tomb on a mythical island that might be somewhere off the coast of Japan. DEAD LIZARD BREWING COMPANY 4507 36th St., Orlando Deadlizardbrewing.com Saturday March 17• 2:30-9 p.m. / Prices vary Join us for our 1st St. Patty’s Day 0-K Walk/Run.This will be a ZERO kilometer walk/run to celebrate St. Patty’s Day and American Craft Beer. In addition to the race, there will be live music by Legacy & Friends and The Rustbelt, yard games, and prizes for best race time and best costume.We will also be featuring a “Go Green” market Urbanico. DR. PHILLIPS CENTER FOR THE PERFORMING ARTS 445 S. Magnolia Ave., Orlando Drphillipscenter.org Tuesday, March 20-25• Times/ Prices vary Inspired by Adrienne Shelly’s beloved film, WAITRESS tells the story of Jenna - a waitress and expert pie maker, Jenna dreams of a way out of her small town and loveless marriage.A baking contest in a nearby county and the town’s new doctor may offer her a chance at a fresh start, while her fellow waitresses offer their own recipes for happiness. 50 Thornton Park Districts St. Patrick’s Day Party FLAPJACK DASH @ NORTHWEST REC COMPLEX terrifying and life-changing. GODS & MONSTERS 5421 International Drive., Orlando Godmonsters.com Saturday, March 17• 8 p.m.-1 a.m. / Prices vary This St Patty’s Day, rise up against the machine! Screw all that green beer and those dumb shamrock accessories and celebrate it in real anarchist style, with our Prom! Scratch that... Prom was dumb and for preps, Punk Rock Prom is a way better time than that lame teenage shmoo. I mean, for one thing, it’s 21+ for the event and EVERYTHING is better with the legal ability to drink beer. WILL’S PUB 1042 N. Mills Ave, Orlando Willspub.org Sunday, March 18• 1 p.m. / Prices vary Will’s A Faire, the one day retro, vintage, local and handmade market is back at Will’s Pub on March 18th for Spring 2018.Will’s A Faire is the Biggest Outdoor/Indoor vendor market in Orlando, with 50 to 75 Vendors, Live Music a la Southern Fried Sunday, Craft Cocktails, Craft Sodas & Craft Brews from Will’s Pub & lil indies, Food Trucks & Free Fun for the Entire Family! NOOR 17 100 Eola Drive S., Orlando Eventbrite.com Saturday, March 17• 7-11p.m. / Prices vary Noor 17 proudly hosts Florida’s 1st Vegan Gala! This will be a night of dance, celebration, laughter and fun as we crank up some awesome music from some musically gifted individuals and give out some fun prizes throughout the night with our Gala games. All food and sweets provided are 100% vegan and all the proceeds will go towards Vegan Awareness Week. CHURCH STREET 99 W. Church St, Orlando Whats2hot.com Saturday, March 24• 2-7 p.m. / Prices vary Orlando Wine Fest is a team of wine and event nerds hell bent on bringing the very best wine festival to Orlando. There will be wine available from every corner of the globe including California, Spain, Chile, and New Zealand. Booths will be spread throughout the street from Garland to Orange Avenue. DRAMA/ROMANCE Friday, March 23 Katie Price has been sheltered at home since childhood with a rare genetic condition, a life-threatening sensitivity to sunlight. Having only her fatheack for company, Katie’s world opens up after dark when she ventures outside to play her guitar. IVANHOE VILLAGE N Orange Ave., Orlando Horizonsvintage.com Saturday, March 24• 1-5 p.m. / Prices vary Save the date for our 1st Arts and Craft Beer Event! Spend an afternoon on beautiful N. Orange Avenue (Ivanhoe Village) and see works by local artists while sipping on delicious local craft beer! HOUSE OF BLUES WEST END TRADING CO. 202 S. Sanford Ave., Sanford Pintsandpaws.com Saturday, March 24• 12-6 p.m. / Prices vary 7th Annual Pints n’ Paws Craft Beer F estival! Located in beautiful historic Downtown Sanford (in between West End Trading Co. and Celery City Craft), Pints n’ Paws Craft Beer Fest Sanford, FL is a craft beer festival that you bring your dog to. Enjoy a multitude of beer, interact with other pet lovers, and most importantly help raise funds for local pet do-gooders Dolly’s Foundation and Pet Rescue by Judy! SCIENCE FICTION/FANTASY Thursday, March 29 In the near future, gamers compete inside a massive video game universe to find an “Easter egg” hidden by the network’s recently deceased creator which promises real life riches.Wade Watts (Tye Sheridan) becomes the first player to successfully navigate the first level of the test, sparking a high-stakes international race to crack the game’s code. THE PLAZA LIVE 425 N. Bumby Ave., Orlando Plazaliveorlando.com Sunday, March 25• 8 p.m. / Prices vary SuicideGirls is bringing back a revamped version of the sexiest show on the planet for 2018! Blackheart Burlesque is unlike any other burlesque act you’ve seen filled with pop-culture references, a high energy indie soundtrack and the sexiest choreographed strip tease to make your inner nerd explode with glee. Wednesday, March 28• 6 p.m. / Prices vary Design your own steampunk-inspired sculpture in this evening class for adults. A variety of recycled materials will be available, but students are encouraged to bring any special materials they want to use. DISNEY’S MAGNOLIA GOLF COURSE 1950 W. Magnolia Palm Dr., Lake Buena Vista Osc.org Thursday, March 29• 6:45 a.m.-1:30 p.m. / Prices vary Join us for Orlando Science Center’s annual Cosmic Golf Challenge! Proceeds will benefit educational programs and opportunities for youth and families to experience fun and meaningful experiences at Orlando Science Center. BILL FREDERICK PARK AT TURKEY LAKE 3401 S. Hiawassee Rd., Orlando theBigbounceamerica.com Friday-Sunday, March 30-April 2• Times/ Prices vary Create an experience of a lifetime for your FRIENDS & FAMILY by bringing them along to THE WORLD’S BIGGEST BOUNCE HOUSE! This magical, candy-colored inflatable castle is 10,000 square feet of fun, games and laughter that can be enjoyed by all ages. 78 MIGUEL @ THE PLAZA LIVE • THURSDAY, MARCH 29 • 8 P.M.
CITYARTS FACTORY 29 S. Orange Ave., Orlando Orlandofashionweeks.com Friday-Saturday, April 6-7• Times/ Prices vary Join us for two nights of high fashion! View the latest trends from local designers, and experience Orlando’s fashion scene first hand. ORLANDO MUSEUM OF ART 2416 N. Mills Ave., Orlando Omart.org Thursday, April 5• 6 p.m. / Prices vary From 6-9 pm on the first Thursday of each month, Central Florida has an opportunity to discover local artists, listen to live music and mingle with an eclectic mix of people.There are cash bars serving wine, beer, soft drinks and water, and café offerings from area restaurants. NORTH LAKE PARK 9055 North Lake Parkway Orlando, FL Pigrunoflakenona.com Saturday, March 31• 9 a.m. / Prices vary The 8th Annual “PIG RUN of Lake Nona” is a non-timed 5K fun run with a TWIST. At the halfway point of the run you will get the chance to enter our famous “PIG PEN” and attempt to eat some delicious donuts! Then, after finishing your delicious treats, you will embark on your journey to finish the last half of the run. BALDWIN PARK New Broad St., Orlando Baldwinparkevents.com Friday, April 6• 5:30 p.m. / Prices vary This FREE sidewalk festival is held the First Friday of every month, and is both family and pet friendly. Over 70 local artisans of all genres will display their art while guests shop and stroll through the heart of downtown Baldwin Park. Also featured are many Central Florida based small businesses and non-profit organizations with products and offerings ranging from health and fitness, to beauty and fashion, as well as community service opportunities. AUDUBON PARK GARDEN DISTRICT Audubon Park District Audubonparkgardens.com Saturday, April 7• 12-5 p.m. / Prices vary Come out for Central Florida’s best artists, native and Florida friendly plants, locally produced artisanal foods, handmade crafts, music, food trucks and more at APGD’s Spring Market at Audubon. 96 JAPANESE BREAKFAST/SNAIL MAIL/ART SCHOOL JOCKS @ THE ABBEY • FRIDAY, APRIL 6 • 8 P.M.